Don’t just go to your local jeweler or pawn shop – see how Speedy Diamond get help you get the best price for your jewelry. Diamonds may be forever, but they may not be forever with the same owner. More and more people are selling diamonds and buying pre-owned diamonds for a variety of reasons. Cash-strapped individuals in an uncertain economy might decide to part with a once-loved heirloom to help pay the bills. A recent divorcee might give up her Blue Nile engagement ring now that the sentimental value is gone and the legal fees are mounting. Grandma’s inheritance might have fallen into someone’s lap, and the cash value of her beloved jewelry might be too enticing for the recipient to pass up. Whatever the reason, there’s never been a better time to sell a diamond ring. According to Statista, the diamond price per carat has increased by ten times since 1960, and that upward trend will only continue as global diamond reserves are drained. After all, diamonds are a naturally occurring carbon-based gemstone, and the earth holds only so many of them. As diamond supplies decreases and demand continues to increase, both for industrial and luxury uses, the diamond resale business is booming. Pricing a diamond ring can be complicated, unlike determining the value of gold which has a calculable melt value. 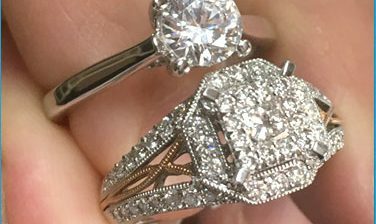 The key to getting the most out of your diamond is educating yourself about your stone, as well knowing how to navigate the process of selling your ring. Let us guide you by the hand. Here’s what you need to know when selling your diamond engagement ring. 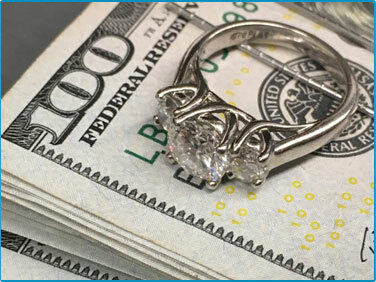 The first step to determining a fair price for your diamond ring is to understand what you have. Just because grandma or your ex-husband told you that your wedding ring is priceless doesn’t make it so. It doesn’t even make it a real diamond! Having your diamonds authenticated and assessed by a qualified appraiser or gemologist so you know what to expect to receive is your first step. Because every diamond is unique, there are numerous ways in which those four c’s combine to equal a fair market value, and a correct assessment starts with a qualified appraiser helping to define the resale value. Look for an experienced appraiser or gemologist. This might cost you around $100, but it’s a small investment to make when considering the knowledge it will provide you. If you’re short on funds, there might be another option. Take your ring to several diamond buyers, pawnbrokers, gold buyers, or antique jewelry shops to be evaluated. They might provide you with some free professional information about your stone, and you’ll find out what they would buy it for. If several dealers offer you a similar price, then you might have a good idea as to the value of your jewelry. Now that you know a bit about your diamond ring and it’s potential value, it’s time to set a realistic asking price. It’s officially time to remove all sentimentality from your jewelry. However, if can let go of it, then setting the right sale price is your next step. The price you expect to receive from the sale of your diamond ring should be realistic, based only on the quality of the stone and market demands at the time of your sale. If you are unrealistic about the value of your diamond, then it won’t sell and you’ll be stuck with a piece of jewelry you don’t want, and missing out on the cash it could bring you. 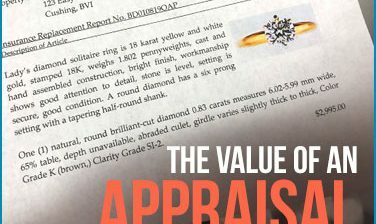 One of the benefits of working with an appraiser to value is that aside from providing you an appraisal that you can use in your sale, they can also offer you invaluable information about the diamond market. They should understand the current diamond market and be able to help you with your pricing strategy. Ask them directly how you might best price your jewelry to obtain top dollar. Spend some time perusing sites like eBay, as well as local jewelry stores. Look for wedding rings and diamond engagement rings that are similar to yours, according to those critical four C’s. This might give you a good idea about the going price for diamonds like yours. Remember, the only reason for someone to buy your pre-owned diamond is that they either want to resell it themselves or because they have found a bargain. Pricing your diamond a bit under its retail value will draw both types of customers and help you obtain a fair price for your stone. 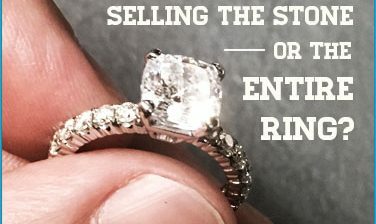 Now that you know the quality of your diamond ring and have a good idea about what you’d like to get for it, it’s time to decide how you want to sell it. There are several avenues for selling diamonds, both within the jewelry industry and outside of it. An important question to consider is how quickly you want to sell your diamond. Selling quickly is a primary benefit to selling your stone to a buyer within the jewelry business. If you’re looking to sellquickly and with as little fuss as possible, take your stone to a diamond dealer or local jeweler. Ask around and find a dealer based on the recommendation of friends who have completed such a deal with fair results. Also, use a jeweler who is a member of the American Gem Society and has a positive rating with the Better Business Bureau. The one big disadvantage of selling your diamond to someone in the industry is that you’re unlikely to get top dollar for your stone (unless you find the right company – more on that below). Local jewelers or pawn shops are going to turn your diamond around and sell it themselves, so they will only buy your diamond beneath its market value. If you have the time and are willing to negotiate, selling your diamond to someone outside the diamond business might be the best way for you to benefit from selling your stone. Members of the public are always looking for quality diamonds at a reasonable price, trying to avoid the inevitable markups found with jewelry retailers. The challenge with a private sale is finding the right buyer. This may take some time, and you might have to deal with some headaches as you separate the con-artists from the legitimate shoppers. Sites like Craigslist are a good place to start finding local buyers, and eBay can work as well, especially if you have experience with it. If all this talk of diamonds and gemologists and 4 C’s and appraisers feel overwhelming and above your pay grade, then Speedy Diamond might be the perfect place for you to sell your diamond at top dollar with little hassle. As one of the top ten independent jewelry stores in America and a member of the American Gem Society with a qualified staff of GIA certified gemologists, we know our diamonds. And unlike jewelry wholesalers, we’re not looking to buy your diamond for a rock bottom price and sell it for a profit. We’re a retailer and will buy your diamond jewelry for a fair price, including your gold for which we will give you 100% of its weighted value. Eliminating the middleman wholesaler allows us to give you more! Our process for buying your diamond ring couldn’t be easier. From Blue Nile to James Allen and many more brands, we are interested in hearing from you. If you’ve done the legwork of getting an appraisal and shopping around, then our Genius Quote process is where you’ll start. A simple online form allows you to enter all of your diamond’s stats, including a photograph and the amount you’d like to receive for your piece. If you can’t be bothered with doing the research, don’t know or care about the 4 C’s, and just want to sell your ring as quickly as possible, then our Standard Quote is for you. You’ll tell us all you can, upload a photo, and we’ll take it from there. With either quote, we’ll follow up quickly with an initial offer and, if you like the deal, information on shipping and the rest of the process. After 40 years in the business, we know diamonds and their value and will always offer you a fair price. It couldn’t be any easier, and our gem experts are always just a phone call away if you have any questions. We will even replace your stone with a quality cubic zirconia at no additional cost if you want to be discreet about selling your gems! Selling a diamond ring shouldn’t be complicated or overwhelming. At Speedy Diamond, we do everything we can to make the process as smooth and painless as possible.